August 13, 1974. Lake County Fair. Crown Point, Indiana. Wow. This was Heaven, Seventh-Level for a 17-year old kid, maybe for anyone. Adrenalin-erupting raw danger, public adoration from my fans, and a motorized mayhem dream-come-true…perfect for me, a rookie demolition derby driver, motorcycle stunt rider, new high school graduate, and United States Marine recruit headed to boot camp soon. I was still waving to the spectators, adjusting my aviator sunglasses, and replaying my name just heard over the loudspeakers in my head when the starting gun rang out. With my left hand still outside the car window opening waving and my big goofy grin still showing my lovely teeth to the crowd, I was shocked into reality. Before I could gather my wits, a competing car rammed into my car’s right rear end, slamming my helmeted head hard into the Supercar door frame. Owwwwww! Gone was that grin now! I had a new plan…stay alive! So what the heck is a “Demolition Derby?” For many, it’s just another county fair oddity, like the incredible blood-sweating hippopotamus, the astonishing two-headed calf, the cuddly 4-H Lionhead rabbits, the extra-thrilling with their safety check lapsed carnival rides, the has-been/never-were bands, and the somewhat sleazy vendors deep-frying anything that’ll fit in their vat. Ain’t it great? “While rules vary from event to event, the typical demolition derby event consists of five or more drivers competing by deliberately ramming their vehicles into one another. The last driver whose vehicle is still operational is awarded the victory,” according to Wikipedia. Yes, I did that. True story. 1974 photo of my actual derby from the Gary Post-Tribune. At age 17, I was the only driver among the 50 or so competing who was under age 30. And the only one who had to have his mommy sign a permission slip! Because I was so young, and because I happened to be driving the newest, most scratch-free car entered, I drew some pre-race attention from reporters. One Gary Post-Tribune reporter, himself on assignment to drive the derby, asked me if I was aware of two deaths in the last year’s derby. 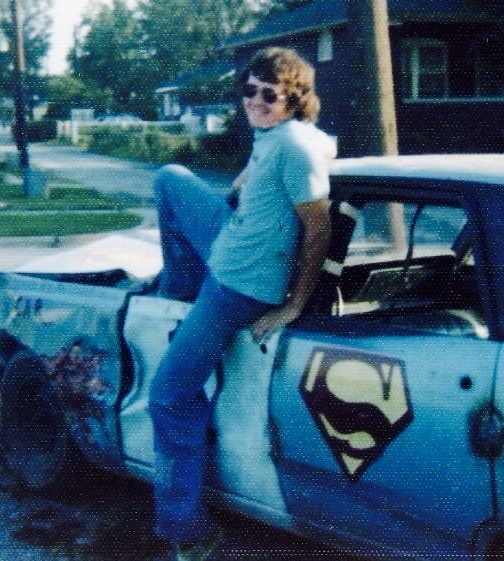 Summoning all forms of testosterone-powered teenage bravado and boldly standing on my unquestioned invulnerability blazoned on the side of my car in the form of Superman’s red “S”, I said “I’m not worried.” And I wasn’t. Yet. Still laughing in the face of danger and all that. Meanwhile, back in the car-crash coliseum, my first taste of lion-action left pretty little birdies tweeting around my head and little stars shining in my eyes. Then I remembered where I was. My head was ringing and my palms were now sweating inside my soggy driving gloves. Time to get down to business! Well. Here’s the place you might be looking for me to wander into some metaphor or life lesson about clobbering the cars of confliction. Maybe pontificate a bit about facing my fears, overcoming my stupid decisions, unleashing my inner risk-taker, or at least processing my unrequited road rage? Ha! You know me too well, but not this time. Driving in the Demolition Derby was just pure crazy fun. This kind of stuff, this daredevilry if you will, has been part of me since I can remember. At that point in my life, I had been involved in bicycle stunt riding and racing, motorcycle stunt riding, a thing or two I just can’t bring myself to share (though a certain Ray Stevens song of that era might be a clue), the derby, and before long, Marine Corps boot camp. Enough of that! Let’s get back to the metaphor-free heavily soaked and muddy arena, filled with raw, unmuffled engine war cries; pungent fumes from leaking fuel lines; cheers from the grandstand fans; sickening solid-contact slam-thuds, an expletive or two from some drivers and the ungodly sounds of rivets popping, welds busting, and frames creaking. Swirl in the odd combined super-stench of cotton candy, nearby manure factories posing as animal show barns, delicious sweet corn, “involuntary personal protein spills” from too full Tilt-A-Whirl riders, (thanks to George Carlin for a most apt euphemism here) and sugar-laden chocolate-covered funnel cakes a la mode, and the picture is complete. It happened fast and it’s hard to describe. I felt a combination of very real fear and a killer instinct. My strategy was simple. Use the rear of the car to do the bashing, protecting the engine and transmission in my Supercar chariot to get me out of the way after landing blow after debilitating blow upon the sadly weaker cars in the arena. Uh huh. Got it. Good plan, General Chesty Puller. So much for strategy! By now, mass confusion reigned. Mud had sprayed through my wire-grid windshield leaving a stylish, artsy, and blinding wet dirt checkerboard across my faceshield. I loved the actual full-power slams into the opposing vehicles, hearing metal rip and smelling the torn rubber from tires shorn with sharp jagged fenders now turned into knives. I was bashing into the other cars with any part of my car handy with all the speed I could summon given the limited muddy traction available. My wide grin had retreated into a tightly clinched “you’re mine, sucker” line. I was afraid and loved it. With attrition the objective, the field had now narrowed. Three, maybe four cars were still circling for the kill. Including me. I was plotting doom for what was left of a Ford Galaxie and ready to punch it to the junk heap when my heart sank. My mighty Chrysler engine just up and died. No one hit me. It just stopped. Another car conked out. Only three cars left now. I was a sitting duck as the field judge began the stopwatch. I had two minutes to get my steed galloping again and I was frantically trying. It was unnerving even as I cranked the starter, watching two cars already lined up and taking a direct bead on me. They hit each other, and both stopped dead just as the judge eliminated me. He reached up to pull down my flag and signal me out. As his hand came down, my Supercar roared to life. I was disqualified but mine was the only car leaving the arena under its own power. Officially, third. Not fair, I thought, but not bad for a boy among men. And only trophies for the top two finishers!?! I then said a bad word. Forgive me. My teenage pit crew, though, were now dancing with delight. Willy, David, Alan, and John (average age 15½) didn’t even check to see if I was alive but instead swarmed Supercar assessing the damage. Within minutes, after I pried my now permanently attached hands from the steering wheel, we had pulled and pounded enough of the metal into shape enough to go again. We re-entered Supercar and me in the second Demolition Derby to be held later that evening. The whole adventure began earlier that summer. Looking back, it was nothing short of mind-boggling that it happened at all. At 17, I was way too young for a bucket list, but since seeing the demolition derby footage in some early scenes of Walt Disney’s “The Love Bug” and hearing radio ads for the “Hurricane Hell Drivers” I wanted to try it. As a poor kid with no disposable car and no money and no experience or contact with this kind of thing whatsoever, it wouldn’t have seemed possible. In those days though, everything seemed possible to me. I tried hard to find a way. The opportunity came when I saw an ad for the Nation-Wide Demolition Derby coming to the Lake County Fair. I quickly researched it to find the entry requirements. I just made it. At 17, I could be in with a parent’s permission. Excitement! Now, all I needed was a car. A throw-away car might have been a huge obstacle for any teenager but especially for me, from a decidedly less-blessed family. And my own pride-and-joy 1967 Volkswagen Beetle was certainly not a derby car. As I was sharing my grand desire to drive in the demolition derby with my pals, things began to come together. One of my friend’s dads owned a used car lot. Hmmm. After telling Alan’s father I would paint the name of his business on the Supercar, he donated the Plymouth, not a scratch on it. He also gave us the use of his garage tools since the car had to be modified for the competition. One thing left. Getting my mother’s signature was easy. She simply couldn’t imagine how in the world her young almost penniless son would ever make this all happen so she inked, “Joan Boggs” with a giggle. Ha! The real giggles belonged to me! And since she had already signed for me to join the Marines, I guess she figured, “oh what the heck!” I was pretty sure she had no idea what a demolition derby was anyway. Once I was legally qualified, we got to work on the car. Prepping it was hilarious fun, as we “removed” all glass and chrome (read “bust it out with extreme prejudice”). We got acquainted with the shop welder as we welded all doors closed. Under the Supercar we crawled to re-locate the gas tank into the area formerly occupied by the removed backseat. Grabbing a hacksaw, off came the mufflers (not a race requirement then, but we wanted it to be loud!). The battery joined the re-located gas tank. All work was done by me and my pediatric pit crew, not a mechanic among us. Now it was time for my vision for how the car would look. 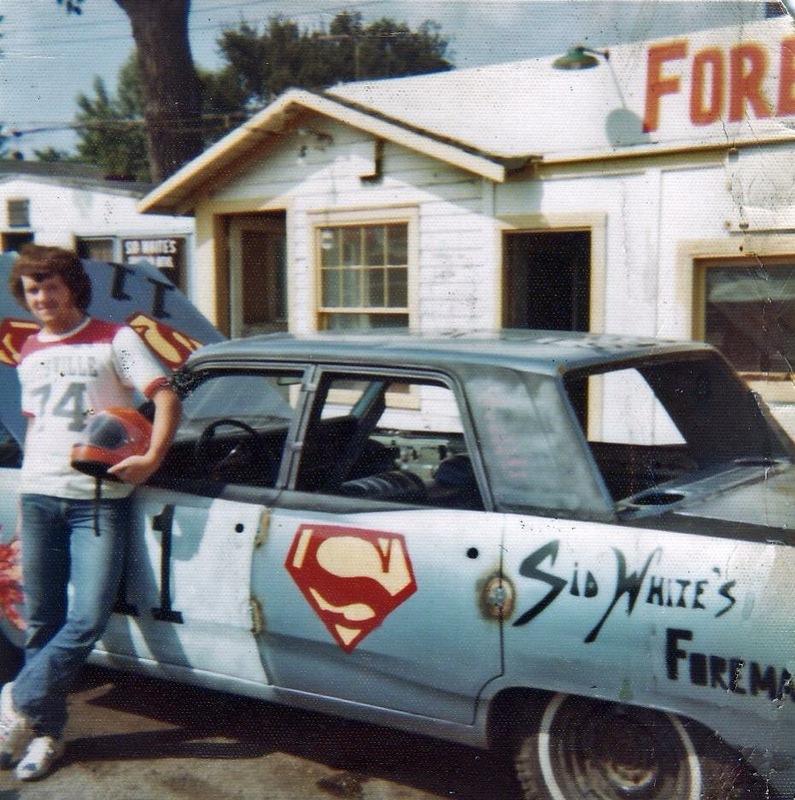 Another wave of delight washed over us as we painted on Superman logos, flames, “Sid White’s Foreman Motors” signs, my name under the driver door, racing numbers, and the names of my pit crew on the side. We finished the car days ahead of time. Then we just had fun driving the crazy loud thing up and down the alley behind the car lot. Our little group of motley teenagers felt like a bonafide NASCAR race crew. Derby day came and as you might guess, my mom was in for a surprise. As I bounded out the door, I asked her if she planned to come to watch. “Watch what?” was the expected response. “That!” I beamed, pointing out to the makeshift racing rig now in front of my house. A pickup truck pulling a trailer carrying Supercar, my daredevil destiny, was now swarming with over-grinning teenage boys wallowing in something way over their heads. Sadly, Mom, totally surprised by it all, didn’t make it to the first heat at the fair. She did get there for the evening derby. And it scared the poor woman to death. By the evening derby, I was a salty pro. No waving to the crowd. All business. Did well for the first few minutes. Then after Supercar took a hard clobbering to the front, something was wrong. My engine was running but no power was getting to the wheels. The blow had managed to disconnect my driveshaft. Still, because my engine was running, everyone thought I remained in the thick of it. I’d get smashed and roll to one end of the arena, plowed into again and roll to the other end. Oh well. It was over. As the giant industrial forklift truck carried me off the track still inside Supercar, I was exhilarated. About four weeks later, I was in United States Marine Corps boot camp, San Diego, California, never to return to the derby. Until tonight. August 15, 2015. Lake County Fair. Crown Point, Indiana. Ahhh. Tonight, as I sit under a makeshift red-and-white-striped tent/awning on the very busy county fair midway, still hearing the roaring of the derby cars in the background, I’m really astounded that this zany dream became a reality in my life. A lot looked, smelled, and sounded the same tonight. It seems both long ago and just yesterday. As I look around at all involved in pulling it off, well, wow. Wow. This week, with help from the “Ask a Librarian” link on the Lake County Public Library website, I found one of the articles written about my derby. The August 13th, 1974 Gary Post-Tribune story is included here. I marked my picture and my brief interview in it. In 1974, I had an outrageous dream, set out to do it against the odds, and motivated others (including my momma!) to get onboard. Not bad. It makes me smile. And I’m proud of it still today. Maybe those kinds of things are still possible. And yes, seeing it all again, stirred in me the desire to drive the derby one more time. Hmmm. Next year. I also admit I’m a bit pensive. On this very day in 1974, I may well have been in the exact same physical location at this exact same time, I don’t know. Here in 2015, after finishing my delicious Mexican corn (purchased from “The Portable Rican” food truck…no, I didn’t make that up!) and waiting for my made-to-order elephant ear deep-fried in what I can only describe as a questionable grease-like substance, I caught myself sizing up my two selves, these two somewhat different Bill Boggs boys. Obviously, a lifetime of difference to be sure (and that Bill Boggs had hair and weighed about 50 pounds less!). Simply, In August 1974, I never looked back at my past. The future was all adventure. No chains on me. No fears. I just lived life to the full. Driving in that demolition derby was the perfect example. A risk worth taking? Do I have any outrageous dreams left? Hmmm. Maybe there is something I can learn tonight from Bill Boggs, Demolition Derby driver. In August 2015, this night, I miss my derby self.